Situated next to the Lowell National Historical Park Visitor Center, Canal Place is only a short walk away from the many restaurants, museums, theaters, parks and galleries located in the vibrant downtown neighborhood. Festivals and concerts dot Lowell's calendar year round. Residents of Canal Place One enjoy an urban lifestyle rich in history and culture. Condominium living is only comfortable and pleasant if all residents accept the responsibility of living together in a community of close neighbors. To that end, it is important that everyone adhere to the established policies adopted by the Association. What follows is an informal overview of Canal Place (One) policies and procedures. Disclaimer: The information given here is meant as a guideline only and should not be considered legally binding. This website was created by a resident as a courtesy; neither she nor the Association guarantee the accuracy of the information contained herein. For a complete copy of the Rules and Regulations or for questions about specific issues, please contact Cathy Deloge at Royal Management. Arrangements must be made with the management office at least one week prior to the moving day. A deposit in the amount of $100.00 is required. The deposit will be refunded, less the cost of any damages to the common areas, when the move has been completed. The “Unit Owner Data” form and “Emergency Information Card” must be filled out and filed in the office prior to the move date. Key cards and parking stickers will be issued when the required forms are completed and the deposit (if applicable) is paid. Furniture and belongings must be moved in and out via the loading dock and freight elevator (see "Delivery of Large Items). Arrangements for the reservation of the freight elevator must be made one week in advance. Keys are available to unlock the second door at the loading dock; many items will not fit through the opening with that door closed. The unit owner/landlord must bring a copy of the fully executed lease, which contains the “Lessee Agreement” signed by the tenant, to the office. NO TENANT WILL BE ALLOWED TO MOVE INTO THE BUILDING UNTIL THE LEASE IS ON FILE IN THE OFFICE. The owner of the unit shall be jointly and severally responsible for any damages to the rented unit. Residents are strictly prohibited from using charcoal or gas or other grills, designed for outdoor use, in the Canal Place One building. Nothing may be left or stored in the fire halls on the bedroom levels. Carbon monoxide detectors are required in all units, at least one on each level. They should be tested frequently and the batteries replaced regularly. PLEASE BE MINDFUL OF THE SPRINKLERS IN THE COMMON AREAS AND IN YOUR UNIT. If any of the heads are knocked off or damaged, thousands of gallons of water will spray into the area, causing great damage. The water can only be turned off by the fire department. No owner shall make or cause to be made changes or alterations involving the Common Areas or structural systems with a Unit without the prior approval of the Board. Requests for structural changes (such as extending the second floor over the foyer) should include stamped plans and specifications prepared by a Commonwealth of Massachusetts registered engineer or architect. The condominium documents further require that permission be obtained from the Board of Trustees before undertaking any changes in a unit such as renovating your kitchen or bathrooms, installing hardwood floors, and so on (changes such as painting and decorating do not require prior approval). Changes involving electrical, plumbing, kitchen and bathroom upgrades all require building permits and the work must be done by contractors properly licensed by the Commonwealth of Massachusetts and who have both Liability and Workman’s Compensation insurance. Please be aware that these rules are not intended to hamper anyone in making improvements to their unit, but to safeguard everyone’s common investment in Canal Place. To avoid disturbance of other Residents, all alteration work must be performed between the hours of 8:00 AM and 5:00 PM, Monday through Friday. Special permission may be granted through the Management Company for work to continue after 5:00 or on Saturday and Sunday. Trash chutes are provided on each floor for the use of Residents. All trash put in the chute must be in a plastic garbage bag and tied. Cardboard boxes and other objects likely to block the chute should not be put down the trash chute. Large boxes (broken down or tied) or bulky trash should be taken to the basement garage and placed neatly in a pile outside the trash room door or placed in the appropriate dumpster. Do not leave boxes or other refuse in the corridors, elevators, or other Common Areas. While the complex does not have its own recycling bins, the City of Lowell offers a Recycling Drop-off Location. For more information, click the recycling link at left. The Association encourages residents to take advantage of this option so as to reduce disposal expenses and keep condo fees down. The complex does not currently have composting bins. DISPOSAL OF FURNITURE, APPLIANCES, CONSTRUCTION MATERIALS, ETC IN THE DUMPSTERS OR DUMPSTER AREAS IS STRICTLY PROHIBITED AND WILL RESULT IN A $500 FINE. Please call Royal Management or stop in the office to make arrangements for the disposal of large items. Residents must take care that all drain lines are properly connected. If any damage results from a back up, overflow or leak from a laundry unit, the Unit Owner will be responsible for any damage caused. Residents should routinely clean the dryer lint trap after each use. The dryer vent at the back of the dryer should be removed and cleaned at regular intervals. Please do not pour cooking oil or grease in the kitchen drains. This causes a build up in the pipes and will result in an unsanitary condition on the lower levels. Each Unit is entitled to one (1) parking space. This does not include deeded basement parking spaces. Resident’s cars must be registered in the Condominium Office. Cars parking in the outside lot require a yellow sticker. All other cars require an purple sticker. 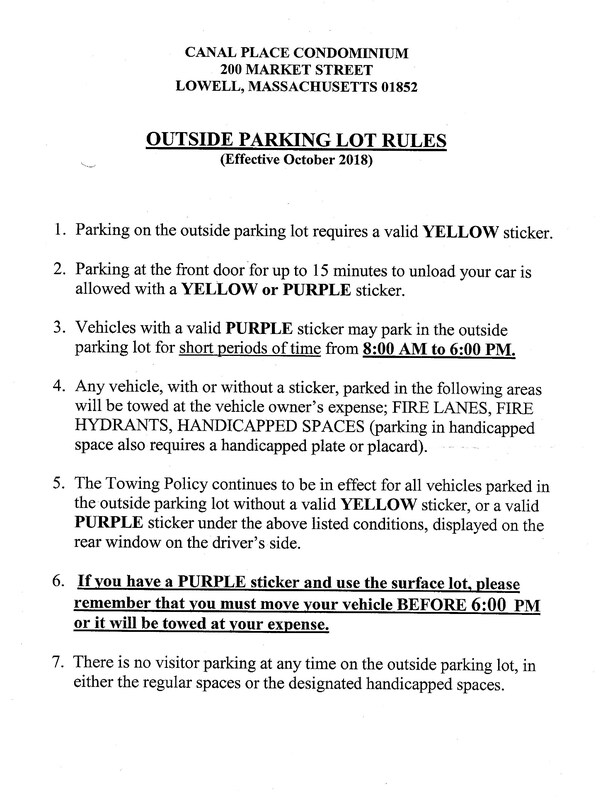 Cars with purple stickers cannot park in the outside lot after 6 pm or they will be towed. Handicap spaces by the entrance of Canal Place are for Canal Place One handicapped residents only. Parking spaces closest to the side entrance are designed for compact cars only. No unattended cars are to be left in the front driveway or at the front of the building at any time. Repair work on any vehicle parked on Canal Place property is prohibited. Vehicles parked in outside parking spaces will be required to be removed for snow plowing. Notices will be posted when this removal is necessary. VEHICLES LEFT IN THE SURFACE LOT DURING A SNOW EMERGENCY MAY BE TOWED AT THE OWNERS EXPENSE. Residents who have parking spaces in the basement garage are not to store bicycles, furniture, boxes, or other items in the parking spaces. Storage sheds, if approved by Royal Management, are allowed provided they fit in the lined space. All cars parking in the basement garage must fit within the designated lines. No car or storage shed can protrude beyond the red poles. Only orderly, domesticated pets—such as dogs, cats, fish, small birds, gerbils and turtles—are allowed in any Unit occupied by a resident owner. TENANTS OR RESIDENTS OTHER THAN THE UNIT OWNER ARE STRICTLY PROHIBITED FROM KEEPING PETS IN ANY UNIT. Any pet causing or creating a nuisance, noise or unreasonable disturbance shall be permanently removed from the condominium upon ten days notice from the Board. Pets must be on a leash or carried at all times, both in and outside of the building. All Unit Owners shall immediately remove and properly dispose of all pet waste and debris of defecation in the Common Areas inside and outside of the building. No pets are to be transported in the passenger (front) elevator. Pets may be transported in the freight (rear) elevator or via the staircases. There is NO SMOKING allowed at any time in the building common areas (halls, fire floors, front & rear stairs, garage, lobby, atrium, etc.). For everyone’s safety, please do not smoke in the common areas. People who smoke outside may not do so within 30 feet of any entrance, and should properly dispose of their cigarette butts; please do not throw them on the ground for someone else to clean up. The Association Rules and Regulations prohibit storage of personal items in common areas. This includes (but is not limited to) the fire hallways off the bedroom levels and the area around a unit’s front door. Because one person’s decorative table is another person’s eyesore, residents should resist the urge to personalize their entry (except as noted below). A floor mat must have a non-offensive design, may not exceed 24” x 36” x 1” thick, must have bound/finished edges, and not be made of sisal or jute or any other material that will shed fibers. A single wall hanging must have a non-offensive design or theme, may not exceed 12” wide x 18” long x 1” thick, and must be centered under the unit number so it does not encroach on the adjoining unit. Items stored in the fire hallways present a fire hazard. The Association has the right to dispose of any such hazards at the owner’s expense and levy a fine. The common areas are for the use and quiet enjoyment of all the residents. They should not be used as play areas, bike paths, exercise areas (other than walking), or for loud, boisterous conversations. The atrium area in particular serves as everyone’s front yard; respect for that is part of being a good neighbor. The side and rear doors are designed for emergency use but do now have fob readers for the convenience of residents. The primary entrance and exit is the main, front door entrance. The handicap elevator in the front lobby can be used by anyone for whom it is dangerous to use the stairs and no longer requires a key. Contact Royal Management with any questions. No activity is allowed that will disturb the peace, quiet, and enjoyment of residents or is an annoyance or nuisance to the Residents. Residents are expected to reduce noise levels between the hours of 10:00 PM and 7:00 AM so that neighbors are not disturbed. There is no parking for guests or visitors on the Canal Place Property. Guests should be directed to the public garage next door. All visitors and guests must enter through the front lobby entrance. Packages delivered by the U.S. Postal Service will be placed in the locked closet in the mailroom and a notice left by the mail carrier in the Unit mailbox. These packages may be picked up when the lobby office is open. For other package delivery services, the carrier should notify the Resident through the intercom system and deliver it to their unit door. If expecting delivery of large items such as furniture or appliances, residents should make arrangements in advance with the lobby office for keys to the rear door, alarm and elevator. Without the key to unlock the second door, the rear access is extremely narrow. The only area that may be used to move in and move out large items is the area directly in front of the rear doors between the side of the building and the small cement wall. The ramped area in front of the other two sets of doors is not the property of Canal Place and is clearly posted “No parking;” parking there may result in being towed. Do not leave a vehicle parked in this area unattended. Bikes may not be stored in the basement garage spaces or fire hallways of the building. There is a locked room in the basement garage with bike racks available for residents to store their bikes when not in use. There is no charge to use this room except for a refundable, $25.00 room key fee. E-check pay: You may pay your fees directly from your computer by logging onto the bank's website at www.mutualofomahabank.com and following the instructions (or use the more direct link at left). Electronic payments (ACH): The instructions and form for preauthorizing a direct debit from your bank account can be found by using the link at left. This assures that your fee is paid on time each month without you having to remember to write and mail the check. If you are already using this method you do not have to re-submit the authorization paper each year. Credit card payments: You may pay with your credit card from your computer by logging onto the bank's website at www.mutualofomahabank.com and following the instructions (or use the more direct link at left). Bank bill pay service: If you currently use a bank bill paying service you must, a) change the mailing address to the one shown on the coupon, b) the account number on the coupon MUST be on the check and c) the check must be made payable to Canal Place Condominium. Condo fee payments may NOT be left in the lobby office or sent directly to Royal Management. Your check will be returned and this may result in a late fee. One of the options above must be used to make your monthly payments.